The way the Choctaws tell it, Chukfi Rabbit is lay-zee. Watch your food when he’s around. Blink once—it’s gone. Silly kids, tricks are for rabbits! Chukfi Rabbit, that is. The laziest—and hungriest—trickster rabbit there is! Deep in Choctaw Country, Chukfi Rabbit is always figuring out some way to avoid work at all costs. When Bear, Turtle, Fox, and Beaver agree on an everybody-work-together day to build Ms. Possum a new house, Chukfi Rabbit says he's too busy to help. Until he hears there will be a feast to eat after the work is done: cornbread biscuits, grape dumplings, tanchi labona (a delicious Choctaw corn stew), and best of all, fresh, homemade butter! So while everyone else helps build the house, Chukfi helps himself to all that yummy butter! The furry fiend! But this greedy trickster will soon learn that being this lazy is hard work! A classic trickster tale in the Choctaw tradition. Greg Rodgers is a storyteller and writer. He is a member of the Choctaw Nation of Oklahoma and often tells traditional and contemporary Choctaw stories at schools, libraries, festivals, and tribal events throughout the country. He is currently completing a Ph.d at the University of Illinois, Urbana. Leslie Stall Widener lives in north Texas in a one-hundred-year old farmhouse with her husband, also an illustrator. When she was a child, she explored every inch of her grandparents' Oklahoma farm, an allotment her grandmother received for her Choctaw ancestry. Leslie's latest book, a collaboration with her sister, is an illustrated history of fashion. ***STARRED REVIEW*** Chukfi is a trickster worthy of the name, and this fresh, funny tale makes an excellent addition to the genre … Choctaw storyteller Rodgers invests the tale, found in the archives of the Oklahoma History Center, with plenty of humor and oral flair … Both text and illustrations positively exude good humor. Chukfi Rabbit was selected for the Alaska Spirit of Reading program, which in 2014-15 is focused on Native American animal and trickster tales. The Alaska Association of School Librarians sponsors the Alaska Spirit of Reading program with funding and support from the Alaska State Library and the Institute of Museum and Library Services. See the full list at http://www.akspiritofreading.com/the-books.html. The Choctaws around home are singing Greg Rodgers’ praises for bringing us another story about Chukfi, our beloved trickster rabbit. A marvelous read for children of all ages—adults too! When this Chukfi rabbit story shuffled through time and forgetfulness to find the ideal storyteller, it came to the right person. Greg Rodgers is one of the best young storytellers of his generation. Each of the animal characters charms thanks to Rodgers and to Leslie Stall Widener who provided the dynamic illustrations. This book belongs in every child’s library and the libraries of some of us older story-lovers. I smiled as I read Chukfi Rabbit's Big, Bad Bellyache ... The story is delightful to read, and the illustrations by Leslie Stall Widener are terrific. The folksy cadence and easygoing humor of Rodgers’s narration make the story fly by. Dressed in ballcaps, sashes, and aprons, Widener’s animal cast is a friendly bunch. Author Greg Rodgers discovered this tale while looking for his own ancestral information in the Oral History Archives in Oklahoma and revived the story for all to enjoy today. Illustrator, Leslie Stall Widener, also has an emotional connection as when she was young girl, she explored her grandmother’s allotted land due to her Choctaw ancestry. Enjoy an old story that doesn’t get old … See the full review for a Chukfi lesson plan for school or story time. Chukfi Rabbit is the perfect tale to inspire the virtues, and teach the satisfactions, of community and teamwork in your little ones. A charming Choctaw trickster tale that delivers a life lesson with a large helping of humor. 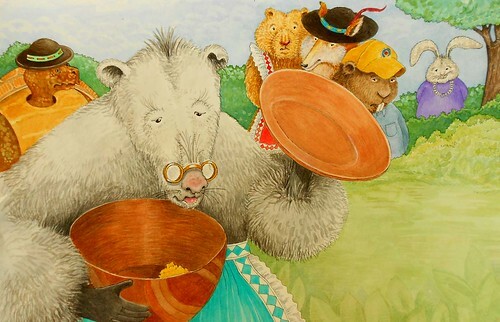 Not only is it a delightful, humorous trickster teaching tale for children, it is a living oral expression from an ancient tradition, with Native inflections, traditional Choctaw animal character names, and a wonderful flavor of the Choctaw world view essence. This is a trickster tale that will bring a smile to anyone reading it even as it teaches an important lesson about being a good neighbor.